Many diners today rely on Yelp’s one to five-star rating system… along with user-generated reviews to find the best (restaurants)… for fine dining. (Littler ranked as the 11th) top upscale restaurant in the Triangle, based on Yelp reviews of 50 or more, (with 4.5 Stars). With the friendliest waitstaff, crackly records spinning on the turntable behind the wood-paneled bar, and big-bulb string lights lending the whole space a romantic glow, you may never want to leave Littler. Gray Brooks, the chef and owner, knows what he’s doing with vegetables (you will not be sorry ordering the roasted carrots—from nearby Durham Co. farm—with harissa, labneh, and savory granola), but the most addictive dish on the menu is the spoon bread. Our waitress described it as a cross between soufflé and grits, and it’s exactly that: cloudlike, with just a bit of texture from the cornmeal, served with tender shrimp and spicy bits of crumbled nduja. Book ahead. Littler aims to be a cabaret for a new generation of flush North Carolina creative types…the cooking at Littler is righteous. The tomato tarte tatin, paired with two blue-veined Boulder of Stilton, beautifully subverts the French apple dish while reminding diners that the tomato is a fruit that responds well to butter and sugar and the Maillard reaction. Latkes, fried to a snap and crowned with yellow button yolks, prove ideal foils for the creamy hunks of applewood-smoked trout. Falafel, made from butter beans and garnished with goat yogurt, tastes brighter and sweeter than the chickpea norm. Littler broadcasts insouciance. Mismatched China, embossed with flowers and seemingly pilfered from a grandee’s break front, lines the tables. Striped napkins, tucked in rings shaped like roosters, sit next to high-sheen cutlery. Lowball glasses, embossed with coppered cartoons and seemingly rescued from a 1970s man cave, slosh with mezcal and rye cocktails. A reel-to-reel deck, the audiophile’s choice, dominates the back bar, bordered by tapes from Bachman-Turner Overdrive, Blondie and Rod Stewart. Viewed from the dining room, Littler’s wall of sound resembles a kind of art installation. But it serves as more than a mere backdrop. 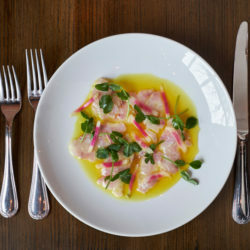 If a menu can be said to make a statement about a restaurant’s mission, then the seasonally evolving offering at Littler is a full-throated shout. Making the loudest noise of all, figuratively speaking, are the chicken fried duck tongues that have been the talk of the town since Littler opened in June in downtown Durham. Joining the chorus is a lineup that currently includes beef heart tartare, potted rabbit with house-made Ritz crackers, pan-roasted Guinea hen, and foraged watercress with smoked scallops. You might call the menu a manifesto, building on a foundation laid by chefs who have been expanding our palates one foraged mushroom, one wild-caught shrimp, one crispy pig ear at a time. To say that this menu stands out – even in Durham, the region’s acknowledged foodie Mecca – would be an understatement…Littler’s menu proclaims that the time for dipping our toe into the waters of these under-utilized and under-appreciated foods has passed. It’s time to dive in. The chicken fried duck tongues inarguably have two things going for them: The dish makes use of a part of the animal that would otherwise go to waste, and the execution is first-rate. Chef Amanda Orser, whose resume includes a decade as chef de cuisine at the now-closed Magnolia Grill in Durham, nails the classic crunchy batter while retaining the moistness of the meat inside. The beef heart tartare is worthy of a long term relationship for an adventurous foodie. I certainly wouldn’t mind a standing date with this voluptuous mound of finely diced (and surprisingly tender) flesh and processed cheese (think Velveeta, and wipe that smirk off your face; it’s an inspired stand-in for the traditional egg yolk), glistening in a mustard seed-spangled sheen of olive oil. “We’ve always been big fans of hosting people at our homes,” (said Gray Brooks). “We wanted to make a place that felt pretty casual and familiar and friendly. [Littler boasts] an unpretentious, neighborly atmosphere reminiscent of both a dinner party and the ‘small corner restaurants’ that Gray would patronize when visiting pals in New York City. Plus a straightforward menu that highlights seasonal, local ingredients. Littler oozes mod, with wood paneling and strung lights, floral plates and colossal artwork, IKEA-chic chairs and grandma-chic duck napkin holders. …Littler was exactly what I wanted it to be: humble in approach, impactful in flavor. The collard greens, braised with guanciale and showered with crunchy breadcrumbs, were vinegary and sweet and spicy and completely unassuming. The sort of dish you try at home and never make half as good.